Two-in-1 interface (male to male) or extension (male to female) PS/2 keyboard & mouse cables, up to 100-feet long. For superb performance, cables are shielded with aluminized mylar foil, featuring 6 pin miniDIN connectors for PS/2 keyboard and mouse. 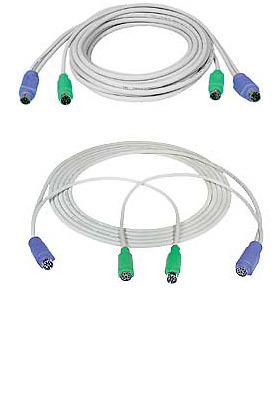 • Interface cables have male connectors on both ends. • Use optional PS/2 gender changer to convert male connector to female connector.